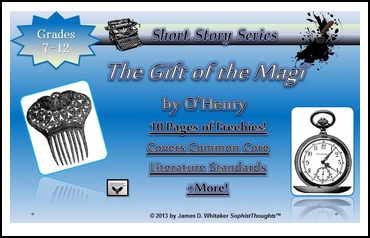 This product contains over 10 pages of well thought-out, sophisticated, and effective graphic organizers to help teach and support a unit study of O. Henry’s classic Short Story “The Gift of the Magi”. My activities are meant for both reinforcement and rigorous instruction in the analysis, synthesis, and evaluation of rigorous texts. You can easily guide students in scaffolding their knowledge and building a strong foundation in high order thinking processes. Approach the text like you have never done before! Hopefully my products will help strengthen your lessons, help your students learn, and make your life easier.